Most people think that you have to buy a lottery ticket to have a chance to win a million dollars. That may hold true most of the time, but in San Jose, California, all you have to do is sell a Mega Millions jackpot winning ticket. Thuy Nguyen has just taken over Jenny’s Gift and Kids Wear in San Jose, four months ago. The store sells lottery tickets and Nguyen is usually happy when his customers win. But perhaps not as happy as when he sold one of the tickets who will share a $636 million jackpot from the Mega Millions Lottery. In California, selling that jackpot winning ticket entitles Nguyen to a million dollar bonus. Nguyen says he is still young so he will continue working. 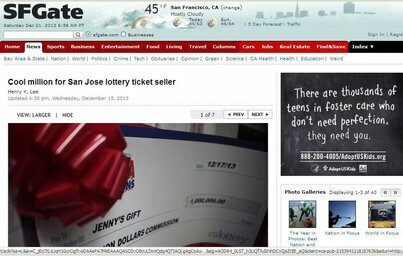 The buyer of the winning ticket in San Jose has yet to come forward to claim the prize.